Great! Vacation time has finally rolled around. Only a week to go and you’re off to explore the wide yonder with your caravan in tow. There just time to check everything out and make sure it’s in working order – nothing like a fault appearing when you’re back of beyond, with the nearest mechanic 200km away! And then you discover …. … the electrics are not working. You’ve had the van for a while, but never even thought about what powers it, it always just worked. Now you think, where is the battery, and what do I need to get? There are all sorts of things in a caravan or RV that the battery needs to power: lights, small appliances, maybe a heater/aircon, TV (really?) and other electrics. And don’t forget it has to charge your mobile phone! So what do you need to consider when choosing and installing a new caravan battery? Many people think that you can simply grab any old car battery off the shelf (probably the cheapest you can find) and stick it in your caravan. But that’s simply not the case. A car battery is designed to provide an electrical charge to start your motor. That’s it. It’s not designed to be drawn on continuously. A caravan battery (also known as a leisure battery or recreation battery) is a completely different beast. It’s designed to power 12V appliances and other electronic devices for an extended period of time – lights on at night, watching TV, electric blanket … you know how it goes!. And although a car battery can be used in emergencies to provide power in a van, it is not the ideal choice on an ongoing basis for a number of reasons. Now that you know you need a caravan battery, what type should you get? There are basically 5 different types of batteries on the market, all of which have their own benefits and shortcomings. That probably doesn’t mean a lot to you, so let’s look at each in turn, so when you’re out shopping you can make an informed, rational decision. – Gel Batteries and AGM (Absorbent Glass Mat) are a safer option, especially in the event of an accident. They are ideal for caravans and RV’s due to their nonhazardous chemistry. Meaning if you do crash you will not find acid running all through your van. And under normal charging conditions these batteries also do not release any gas. Their lifespan is much longer than conventional lead acid car batteries. In other words, they can withstand a greater number of charging cycles. Conversely they are also much more expensive. So you’ll have to weigh up the value of a longer life battery over the added expense. Even though a gel or AGM battery might be more expensive to begin with, over the lifespan of your caravan they may well work out cheaper. – Maintenance Free Calcium batteries are sealed batteries that do not require checking and refilling of battery water. They are the least expensive caravan or RV battery you will find. Whilst they can be used in any situation where you might use an AGM or Gel battery, they are also more expensive. What you’re paying for is the ability to accept charge faster (perfect for pairing with a solar panel) and a much longer shelf life. That means your caravan can sit around for longer without use, and when it does see the daylight, you’ll be up and going much quicker. – Lithium-ion batteries are the new kid on the block. If you want to save some weight (and thus substantial fuel costs) on your long outback sojourn this is your best bet. A lithium ion battery provides the same amp hours as an AGM or Gel battery, but at half the weight. They do however have some specific charging requirements, different to your more standard batteries. So if going this route, make sure you’re kitted out with the right gear. Victron Energy provides some excellent solutions for Lithium battery charging. Check them out here. Unless you have opted for a sealed battery, regular care and maintenance of your battery will ensure that it lasts longer and prevent such hazards as the leaking of highly corrosive acid. If you’re at all concerned about these kind of hazards, steer away from purchasing a standard lead-acid battery.And instead make your life easier with a Gel, AGM or Lead Crystal battery, the least hazardous kinds of batteries on the market. However, if you do continue with a lead-acid battery, find a good safe position for it in your van and fit it securely. Doing that will minimise the risk of leaking acid. Installing a battery in your caravan or RV should be a simple matter of reading the instruction manual for your vehicle and following instructions. Store or position your battery in a well ventilated area as it releases gas both while in operation and during charging. While AGM and Gel batteries do not vent gas under normal conditions, they still need to be in a ventilated area. If your charging equipment fails and over-charges the batteries, they will vent gas out of a one way valve. These type of batteries are also referred to as valve-regulated batteries. Keep your batteries in a cool and dry area. Mount the battery with fittings suitable for permanent installation. You don’t want your battery bouncing around because you only tied it down with an octopus strap! How long any given battery will provide power for your van is a function of its capacity in relation to your power consumption. Figure out your maximum time between battery charges, then calculate an estimate of how much power you will use in that time. Then go and choose a new battery based on the result you just got – after all, you don’t want to suddenly lose power in the middle of a Home & Away episode! But make sure there’s plenty of reserve capacity in the battery – see “Charging” below. Think about how many appliances you need to run and for what length of time. How many lights are you running, what type and for how long? For example LED lights use a huge amount less power than incandescent. What other electrical equipment might you have that’s not so obvious? Charging 3 phones and an iPad every night, perhaps even a laptop, will use power that you need to cater for. At the end of the day, your travelling lifestyle might be such that you only run a few lights and one or two appliances for a short time each day. So there’s no use installing a caravan battery with a large capacity for that usage, it’s simply not necessary. And you’ll be able to save weight and fuel with a smaller battery. Just hook up the cables from your battery charger to the battery terminals, turn on the power and away you go. Not so simple, if you want your battery to last. Charging your battery incorrectly can cause damage that impacts performance, or even reduces its lifespan. Never allow your caravan battery to run entirely flat before hooking up the charger. You’ll achieve a much better lifespan for your battery if you begin charging when the battery drops to about 50% charge. So make sure you allow for that when calculating your battery capacity. Contrary to popular belief, trickle charging is not bad for your battery. If your battery is constantly in use it’s better for it to remain on a trickle charge rather than recharging it when it reaches a 50% charge level. When you do trickle charge, make sure your charger is fully regulated and switches off when your battery is fully charged or you could end up causing damage. How about when your van is put away for the winter and the battery is not being used for a good while? All batteries lose charge over time even if they are not being used. So to keep your battery happy and maximise its lifespan, hook it up to a smart charger while not in use. If your battery is allowed to run flat and remain that way it will allow sulphation to occur, which is a white deposit that forms on the plates. Once this happens, your battery is essentially useless. **Warning** DO NOT overcharge your battery! When it’s fully charged, disconnect it from the charger to prevent reduction of electrolyte levels. If your battery is a maintenance free or sealed battery you will not be able to top up the electrolyte levels and your battery will die sooner. If you’re going to be away from charging opportunities for an extended period or find your battery is simply not lasting long enough, add another battery as a back up or to run in parallel with the first battery. 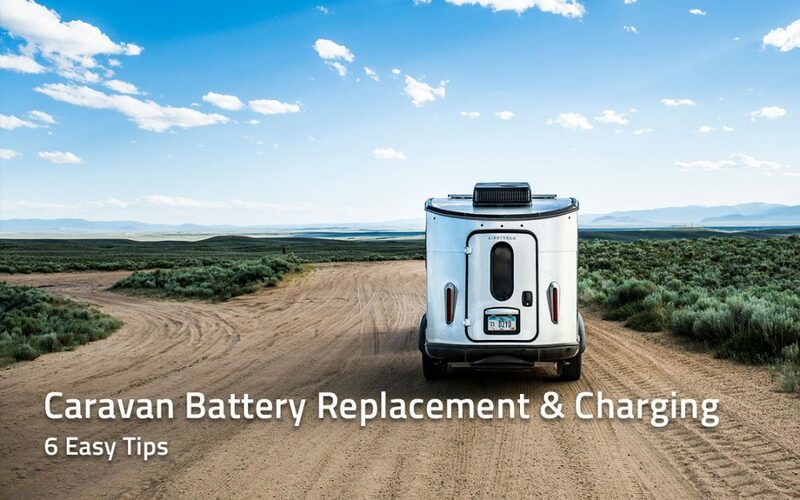 With your new battery(ies) firmly in place and charging equipment ready, we wish you happy camping! Still not quite sure what you need? Talk to our knowledgeable experts on 03 9793 6655 or drop in to one of our stores and we’ll get you sorted out.